They discovered that kids who spent more time with the dogs had a 6 times greater chance of coming away with superbug bacteria than kids who spent less time with the animals. But the study also found that washing the dogs before visits and using special wipes while they're in the hospital took away the risk of spreading that bacteria. 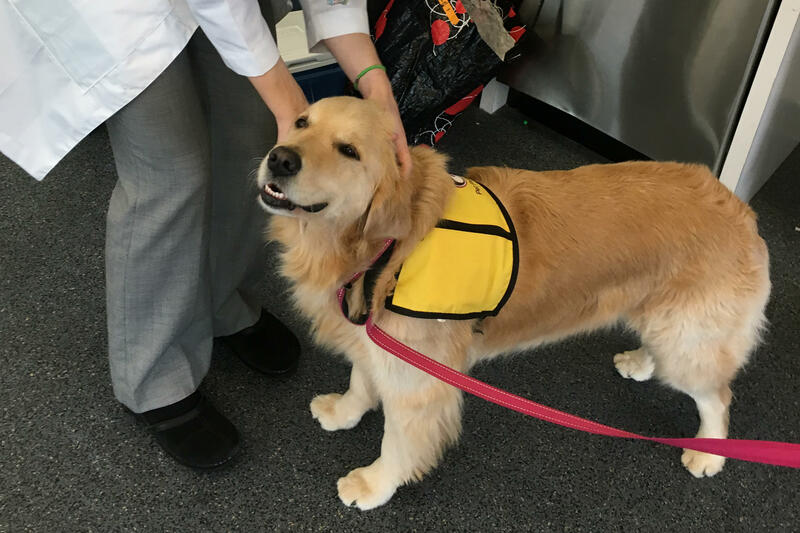 "Whether covered in fur, feathers or scales, animals have the potential to carry germs that make people sick," said Casey Barton Behravesh of the Centers for Disease Control and Prevention. "Our hypothesis is it's really person-to-person transmission, but it happened through contact with the fur," said Davis, a Johns Hopkins public health researcher and veterinarian. Under hospital protocols, therapy dogs must be bathed within a day of a visit and are checked for wounds or other health problems. Children who see them are supposed to use hand sanitizer "but that wasn't strictly enforced," said Kathryn Dalton, another one of the researchers. Later in the study, the researchers asked the dogs' owners to bathe the animals with a special shampoo before the visits. They also had the dogs patted down every five to 10 minutes with disinfecting wipes at the hospital. "I really had the opportunity to see how important these dogs were to the patients," Dalton said. After the sessions with the dogs, the kids "would say how much this made their day."